Since its founding over 60 years ago, Pacific Broach and Engineering has been specializing in the manufacturing of precision timing belt pulleys. We work closely with our customers to assist in the design and manufacture of special purpose and custom made products. Customer demands are met and exceeded by utilizing state-of-the-art CNC equipment and having a highly skilled staff working with systems and procedures which build in quality. Pacific Broach and Engineering is licensed to cut, and provides pulleys to major belt manufacturers, including Power Grip GT. We have the capabilities to provide product in all standard sizes MXL to14mm, plus custom pieces to your specifications. Pacific Broach and Engineering has maintained our place in the industry with a constant focus on the quality of our products and by ensuring on time deliveries of the exact product ordered. We do this by combining the West Coast largest collection of gear shapers, hobbers with our State Of The Art CNC mills and lathes. Our 60,000 square foot facilities include a full production foundry and a complete secondary operation. 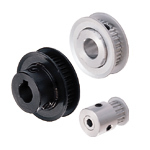 Timing Belt Pulleys can be constructed to ensure accurate positioning, repeatability, and drive performance. Pacific Broach and Engineering manufactures and stocks standard and metric Pulley Stock, Standard and Metric Pulleys, Micro-V and Spur Gears to meet our customer's requirements. We look forward to assisting you.